Growing up, we used to go camping on a farm. There were so many ticks that we called it Camp Tick-a-lot. Arlington is getting right up there. Several weeks ago, there was one on Rob’s head at the park. I have found two on me – just crawling around. Tonight, we found our fourth tick. It was during bath time and Justin had just finished washing Robbie’s hair when he say it, attached to the back of Robbie’s head. The poor baby immediately sensed that something was wrong and turned around just in time to see me put a bobby pin in a flame. That’s when the screaming started. Eventually, Justin was able to pull the culprit out of Robbie’s head, with some skin still attached to it’s greedy little mouth. Justin may or may to have burned it in an apple cinnamon flame… And poor Robbie kept crying about the bad bug. I think we’ll be having tick checks every night. Now if only I could get my own scalp to stop itching! My mom sang it to us when we were little. That and a few other classics that I can’t remember the words or the tunes to. So, I stick to “Edelweiss”. As it is, it’s all I can do to get through that without sounding terrible. But, you know what? Robbie loves it. He asks for it every night after we read stories. In fact, it’s even a little better than that. He crawls up into my lap and asks to cuddle like a baby. I know I probably shouldn’t indulge baby stuff like that, but he never wanted to cuddle when he was a baby. Robbie just wanted to be a big boy. Given all the bedtime trouble we’ve had over the past few months, I grab onto the opportunity with both hands. So, up he climbs, curling into me, and gazing up into my face, whispering, “Sing ‘Edelweiss’, please, Mom.” We sit and rock and sing. Robbie closes his eyes, and I can feel him relax into me. Sometimes he asks to move into our bed to go to sleep because he likes the big bed (after all, who needs a toddler bed when you’re almost three?). At first, he wanted to cuddle all the time. Now, he just wants a round or two of “Edelweiss” and enough space to get comfortable. So it looks like we might have found the great compromise for bedtime. A little cuddling. A little song. And a little more bed. I want to be patient. I need to be patient. I am not patient. Unfortunately, last night exemplified this. Robbie refused to go to bed. Flat out refused. Bedtime took three hours. At one point, actually at more than one point, both of us were in tears. I did everything the books, websites, and more experienced parents tell you not to do. There was yelling. Threatening. Taking away of toys. Everything that I could think of, except being calm and rational. When Justin finally took over the bedtime attempts, I curled up in bed and cried. Robbie is old enough to remember this stuff now. What if this one night, this one (of many, I’m sure) bad decisions sticks with him? And then Robbie woke up this morning. He woke up, smiling and telling me about his fun rest and how much he loved me. That’s when I really knew. He’s going to love me no matter what. We’re both going to mess up – a lot. And that’s OK. It’s the mess-ups that make the next day that much sweeter. If I hadn’t been so terrible last night, I might not have taken Robbie on a two-mile walk this afternoon where he pretended to be a pirate, went fishing, climbed a rock, and jumped in every puddle along the way. I might not have taken the extra time to cuddle and rock him tonight when he asked for it the fourth time. So, I’ll take a night of being a bad parent if it means I can refocus and come back more determined to be better the next day. Yesterday, I received a barrage of panicked emails from Justin; he couldn’t find his college ring anywhere. All day, I followed Justin’s quest around the house as he tore through every cushion, drawer, and stray sock in the house. Eventually, I suggested that he wait until Robbie got home and ask if he knew where it was. After all, lately he’s been playing pirate and a ring seems like a pretty good treasure. My only concern was that it was in the litter box because, you know, you bury treasure in the sand. At this point, Robbie is halfway up the stairs, irritated that Justin didn’t understand the direction the first time. Justin, having nothing to lose, followed Robbie upstairs. Robbie ran into his room, knelt down on the floor, and reached under his train table. He pulled out his Fisher-Price airplane, removed Goofy from the inside, rummaged around, and eventually produced Justin’s college ring. Robbie handed Justin the ring, saying, “See, Jus? Daddy ring,” and walked back downstairs. He’s smooth; I have to give him that. Last night, as I was putting Robbie to bed, he looked at me very sincerely and started playing with my hair. He took his other hand and ran it over my face. With big, brown eyes, he looked at me and said, “Beautiful. Mommy so beautiful.” And my heart melted. I wanted to wrap him up in my arms and cover him in kisses. It was the most perfect compliment I had ever received. Lately, my cherub has taken more of an interest in drawing. In fact, he’s even played a few rounds of Draw Something for me. Oddly, my poor, unsuspecting friend had no idea that Robbie had selected the word “mushroom.” Sure, he’s always liked to scribble, readily agreeing to draw anything you ask him. Nemo? Sure. Nona and Pops? He’ll even throw in Barkley for good measure. Of course, you can never tell one straight line from the other. Until this weekend. 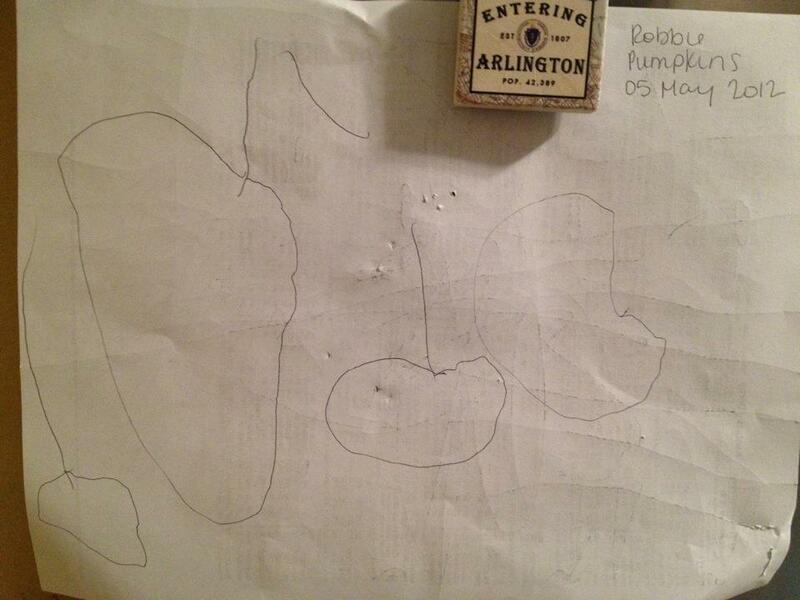 Robbie grabbed the racing form on Derby Day, sat down on the stairs, and said he was going to draw pumpkins. And then, much to my amazement, he did. I didn’t know what to do, so I cried. I cried for the baby he wasn’t anymore. For the big boy he so desperately wants to be. And for all the pride I couldn’t contain in my heart. Robbie’s eyes got huge, and he said, very seriously, “Want a merry Christmas, Mom. Stay in bed.” And he did. Until 2:30 in the morning when he crawled in bed with me. Unfortunately, none of this worked tonight. I rolled over early this morning, prepared to ask Justin to scoot over when I saw it. The bed bug. He had crawled in sometime in the middle of the night, dragging his blanket with him and leaving it on the floor. Not wanting Justin to miss this, I poked him until he woke up. Justin quickly assessed the situation, determined Robbie was dry, and happily passed him over to me when I asked. Just a few minutes to cuddle. Robbie nestled his head in the crook of my neck, flung his arm around me, and snuggled in. He’s been doing this a lot lately; almost every night, actually. Usually it’s because he needs new pajamas and sheets, but it doesn’t matter. I love that he comes into our room and crawls into bed. But, mostly, I love that he goes to Justin’s side first. And I wish that we had a king size bed. Yesterday morning, Justin and I were running around the house trying to get it ready for yet another open house (still looking for that perfect buyer!). I was in the living room, making sure the furniture was smelling fresh when I heard the crash outside. I figured our neighbor must have dropped something and looked out our second-floor window. All I could see was the roof of the first-floor bay window. And one bright orange ear plug. And one arm chair patch from our bedroom chair. This did not look promising. I yelled to Justin to close the window and keep Robbie away from it and headed outside. I ran through everything in our room and figured it was probably the remote control. As I passed our neighbor’s car, I breathed a sigh of relief that the windshield still appeared to be in tact. Then I saw a flash of turquoise on the other side of the fence. My Nook cover. I drew a little closer, already seeing red as I realized what had happened. My poor Nook, facedown, on the ground next to the cover. Shattered. Now, in retrospect, I realize how lucky we are that it was the Nook that went out the window and not Robbie himself. I could see that happening, him trying to reach something he’s flung out and toppling out the window. Perhaps this is why I acted so angrily, the sheer panic of what could have happened. The realization that Robbie could have been seriously injured or worse. I try to always open the windows from the top to avoid any chance of our family being on the news when the weather gets warm and the windows go up. Unfortunately, I forgot in our bedroom. So, please, take a few minutes to check your windows. After all, I don’t want to see any of you on the evening news, either. It was brutal. Even at it’s best, the drive to or from Myrtle Beach is lengthy – around fifteen hours. Our drive home was, unfortunately, much longer. We were in the car for eighteen hours. In the pouring rain. With a cranky toddler. Who only slept for an hour. Initially, it was fine. Not fun, because the ride home from vacation never stacks up to the ride to vacation. But we were managing. Early on, Justin and I discovered the importance of a hot Krispy Kreme donut (how can I possibly eat anything else ever again?). 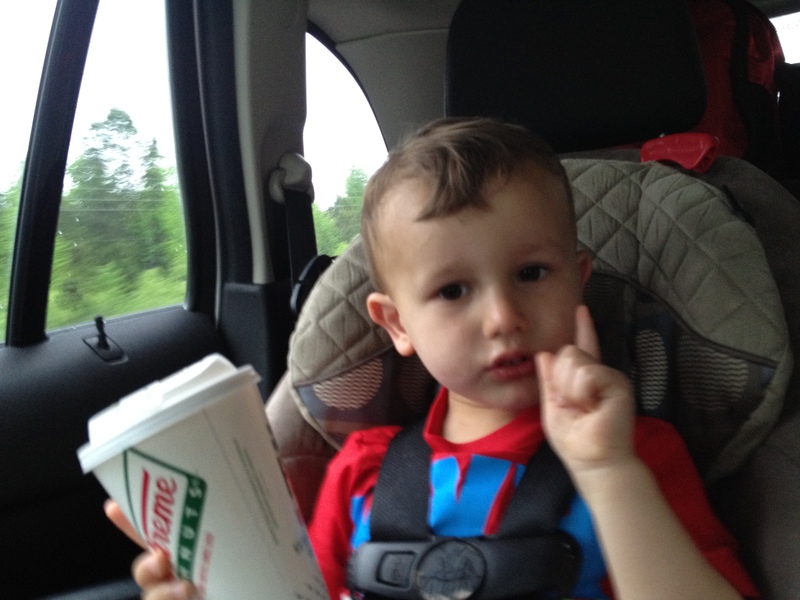 Robbie lectured on the finer points of coffee. We listened to Born to Run, and it took everything I had not to tell Justin to pull over and let me run the last 750 miles home. After all, if the crazy people in the book could do it, so could I. And it might be better than our drive. Did I mention the traffic? We were in a jam for nearly 200 miles. We saw all of Virginia, Maryland, and Delaware in excruciatingly slow detail. We passed nine car wrecks, one of which had a hole in the windshield. When we finally pulled up to our house, it was 12:30 Monday morning. The rain was coming down in torrents. Our car was packed to the gills, with at least three trips worth of items that actually had to come in that night. Oh, and our lovely child was wide awake and screaming. Unfortunately, I wasn’t able to go to sleep so easily. When I finally did drift off, I had that terrible driving dream. You know, the one after you’ve been driving in the pouring rain in the dark for hours and are tired and keep trying to shake your head to wake yourself up? Except you’re not driving; you’re trying to relish the four hours of sleep you need. Fail.